The Assessment Exemplar Tool has been designed to closely simulate how a medication dosage calculation problem would need to be solved in a clinical setting. The problem solving process has essentially 4 steps. 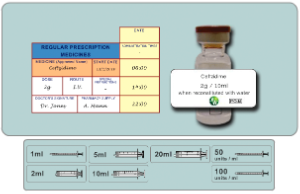 The first step in the problem solving process is knowing where to locate the required numerical values on the prescription chart and medication container label. This step requires the user to set up the numerical values in an appropriate equation form and to calculate the correct quantity of medication to be administered or rate of IV solution to be delivered. In the research study, participants were asked to use pencil and paper to do this - no calculators were allowed. This step has particular relevance to liquid medicine and injection problems. The user must choose the most appropriate vehicle (e.g. 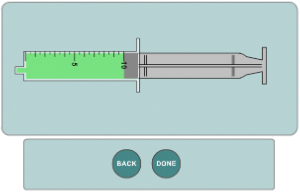 syringe or medicine pot) to accurately measure the required quantity of medication. This final step requires the user to accurately dispense or draw up the quantity of medication to be administered / accurately set a volumetric pump or manually adjust a drop rate control mechanism. The problem solving process for each of the 4 medication domains differs slightly as it would in a practice setting. If you would like to watch a short video clip demonstration of each then click the links on the sidebar to the right. If you would like to try the actual assessment problems used for the research then click the link. You will be presented with full feedback on your performance!